Did modern Homo sapiens evolve in different parts of Africa? A new paper by Eleanor Scerri and many colleagues, however, questions this conventional wisdom. The paper, an opinion piece rather than a scientific paper, appears in Trends in Ecology and Evolution (click on screenshot to see it, free with UnPaywall; the reference is at bottom, and a free pdf is here), limns what is known as the “multiregional hypothesis” for modern H. sapiens. This is the view that there were many semi-isolated populations of our ancestor scattered throughout Africa, and that each evolved quasi-independently because there were geographic and climatic barriers that reduced gene flow between the groups. Each population then evolved different traits—of behavior, morphology, and mentation—that eventually combined through more extensive migration into one species that then spread throughout Africa and then the world. It is as if a group of tailors were to craft a garment, each responding to local tastes and materials, and then those garments were combined into one garment that became the “standard and universal” one. “Anatomically modern humans” date from about 315,000 years ago, with the first finds being in Moroccan caves at Jebel Irhoud. These finds contravened the idea that the earliest humans evolved in East Africa, and suggest that already at that time modern H. sapiens was widely distributed throughout Africa. However, the Jebel Irhoud skulls, while having most of the features of modern human skulls, were relatively elongated. 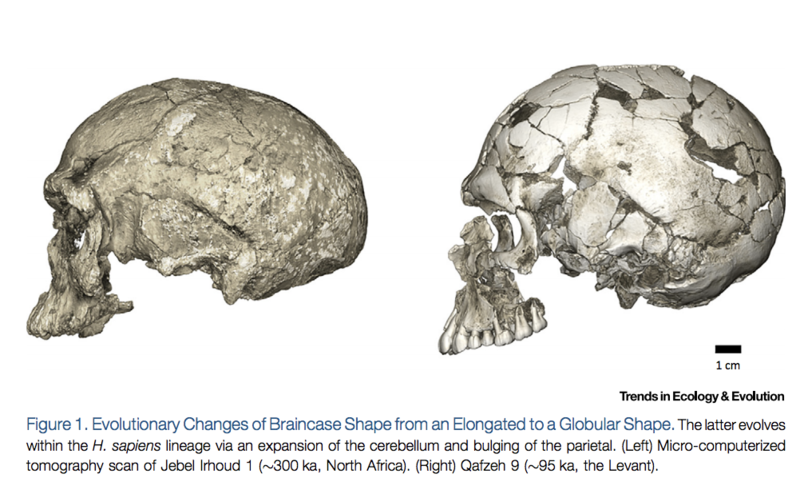 Here’s the earliest find (left) compared with a more recent (95,000 years old) modern H. sapiens skull. The elongation of the earlier one is evident. Multiregional evolution is supported by the authors’ contention that human populations were structured morphologically as late as 15,000 years ago, with some retaining more ancestral skeletons and others being more advanced—but all considered by anthropologists to be part of the single species H. sapiens sapiens (“modern” Homo sapiens). Likewise, different populations of H. sapiens sapiens had different stone tools at about the same time, with some being more advanced than others, and this regional differentiation also held for other cultural artifacts like bone tools and shell beads. This too suggests a subdivided species, perhaps with different populations having different degrees of mental/neurological evolution. What caused this differentiation? The authors aren’t sure, but say a likely cause was different environments that not only isolated populations from each other, but imposed different selection pressures on them. Climate is an obvious difference, with the figure below showing big differences in precipitation among parts of Africa that housed different populations of H. sapiens sapiens (areas within colored squares). Note the variation among localities even at the same time. These would cause obvious barriers as dry places would impede migration between wet places (the Sahara region, with less precipitation, is an obvious barrier). (from paper): Middle and Late Pleistocene African Environmental Variability in Space and Time. (Left) Map of Africa with key archaeological and fossil sites discussed in the text. Colored boxes indicate averaged regions for simulated precipitation changes from the transient glacial/interglacial LOVECLIM climate model experiment . (Right) Precipitation changes (%) relative to the long-term 784 thousand year mean in the key regions highlighted in left panel, as simulated by transient 784 thousand year-long LOVECLIM climate model simulation . From top to bottom the regions are eastern equatorial Africa, southern Africa, northwestern Africa, and the central Sahara region. Precipitation would affect the vegetable and animal food available, and hence the means of foraging and food preparation, and that would affect selection for tool usage and for forming different kinds of tools. Those pressures, in turn, could affect social evolution and the structure of our brains. Further, random differences in the frequencies of genes arising by genetic drift could act as different beginning substrates for natural selection, as the course of natural selection depends on its genetic and morphological starting points. The best metaphor for this [the authors’ “multiregionalism” hypothesis] isn’t a tree. It’s a braided river—a group of streams that are all part of the same system, but that weave into and out of each other. These streams eventually merge into the same big channel, but it takes time—hundreds of thousands of years. For most of our history, any one group of Homo sapiens had just some of the full constellation of features that we use to define ourselves. “People back then looked more different to each other than any populations do today,” says Scerri, “and it’s very hard to answer what an early Homo sapiens looked like. But there was then a continent-wide trend to the modern human form.” Indeed, the first people who had the complete set probably appeared between 40,000 and 100,000 years ago. But there’s evidence against the hypothesis as well, the most telling being genetic analyses suggesting that different populations of humans in Africa didn’t diverge from each other 300,000 years or so ago, but between 100,000 and 150,000 years ago, suggesting a genetic and populational uniformity before that. So we have a conflict between what the genetic data tell us and what morphology and tool use tell us. This may not be a problem since the genetic data is not yet rock-solid. Nevertheless, we should take the paper as tentative but suggestive, which is why it’s an “opinion” piece rather than a regular scientific article. The implications aren’t that important for non-paleobiologists. Although the multiregional theory suggests that our species emerged in a patchwork fashion, like Yong’s braided rivers, we know that as that species spread throughout the world in perhaps several egresses from Africa, those spreads did not emanate from many different places in Africa. And they don’t overturn the indubitable fact that humans are, in essence, complex African apes. This entry was written by whyevolutionistrue and posted on July 15, 2018 at 9:30 am and filed under anthropology, Uncategorized. Bookmark the permalink. Follow any comments here with the RSS feed for this post. Both comments and trackbacks are currently closed. Very interesting post! And useful for my lecture on human evolution next semester. Is this a typo, and should that read 150,000? 15,000 years ago, humans (i.e., sapiens) were definitely structured because, by then, they had migrated across Asia into Australia also the Americas. Perhaps the 15,000 years includes the morphological differences that we see between Arctic peoples and, say Kenyan populations. The racial groups that we see today following the great dispersal out of Africa. Even though modern populations are all the same species and subspecies, they include many differences in overall configuration. Yes, and fascinating. You have to wonder what the lives of our various ancestors were like. Undoubtedly there experiences took many different forms. You could probably have written a novel about each individual life. If I get it correctly, it seems that some populations evolved independently for some time, then met and hybridized into a uniform population which is likely to have passed through a bottleneck at a little later moment. I think that the morphological data are important, but the tool data not so much, because a population can “culturally appropriate” tools invented by other populations. Maybe not fully independently. Ring species experience gene flow throughout their range, but not enough to homogenize populations. It could be that genetic information passed between populations, but only in a limited capacity, which maintained their ability to interbreed but still allowed for diversification of the populations. I think this matches the relationship between more diverged populations, such as between modern humans and Neanderthals or Denisovans. Yes, I trust the meager genetic data mor, likely since I understand it better. The morphological evidence is a bit fuzzy too due to the same factors, as as the climate evidence for isolation barriers. Morphology of hominins have always been mosaic. And Australia had a similar history – for a shorter time – but not complete isolation. Else this is cool since it comes right after the find of 2.1 Myrs old tools in Asia, as well as results on more modern South East Asia gene flows. South East Asia modern migration patterns were similar to Europe and India with a few (actually 4 in all cases) dominant components. I am also struck by the similarity in very old migration patterns between regions. The shifting nature of these habitable zones means that human populations would have gone through many cycles of isolation—leading to local adaptation and the development of unique material culture and biological makeup—followed by genetic and cultural mixing. And AFAIU Australia show a similar pattern of waxing, waning and migration pulses in small populations for a long time. Which leads me to ask, are there some remnant populations which have been isolated for a very long time and represent a human form that was outside the main branch. Perhaps they would amount to a living time capsule. Very, very interesting. Thanks for the post and the analysis. I would expect some interbreeding between the separate groups but not as frequent as the theory should guests. Don’t see any reason groups once separated would merge back together. Might be with dramatic climate or geological changes but as with the Homo Sapiens and Neanderthals it seem one group would dominate and the other virtually disappear. If they are still similar enough genetically, coming in contact after a period of isolation is likely to result into merging. See how today’s humans are gradually advancing to a uniform population. Some small amount of genetic flow in all directions is likely given half a chance. Slight changes in environmental conditions or human technology could stimulate lots of sexual interaction. If that turns out to be true, the implications are at least very interesting and possibly quite important. That is roughly the same time at which humans took the so-called “great leap forward”, and became a much more successful species. From then on, the population starts growing rapidly, spreads out all over the world, knocks out multiple species of large mammals, and gets well on the way to building civilizations. Agriculture, I think, is pegged at about 10,000 years ago. So, humans must have spent 30,000 thousand years before that as fully formed humans living as hunter-gatherers. The cave art in Europe dates from around 30,000 years ago. So, perhaps modern humans actually emerged quite late and relatively suddenly. The contradiction seems to be not between the genetic data and the morphology/tool data, but between the genetic data and the authors’ interpretation of the morphology/tool data. Just because populations that were similar to the proto-modern humans in morphology and tool use had dispersed early that does not necessarily mean that they contributed a significant ancestry to later modern humans. Later waves could have washed them away, instead of a near equal fusion. Well I was going to say that, but you said it much better and more concise than I would have. Nevertheless, I think molecular data trump (sorry) morphological/tool data, we just haven’t enough yet. I was wondering about that. The East Africa bit about the origin of modern H. sapiens rests upon genetic data. If I can say it correctly (correct if I am wrong): there, we find the greatest genetic diversity of humans and so we find the oldest extant population of humans. As far as I know the genetic data only suggest that the population dispersal of actual modern humans happened somewhat late (later than the assumed date of these populations mentioned in the article). The genetic data does not say that the source area of the dispersal was East Africa strictly. The claim about genetic diversity is about the entire (Sub-Saharan) Africa, not specifically about East Africa. East Africa was suggested as the homeland of anatomically modern humans based on archaeology. BTW, a huge migration went through East Africa quite recently (the Bantu expansion) that drastically changed the genetic landscape here and this was probably not the first time. When early hominid migration is discussed, I’ve not seen any hypotheses about why they migrated, or what proportion of populations migrated. Obviously populations didn’t just all pack up and leave – some (most?) didn’t migrate, else the places they migrated from would have become empty of hominids. Was it only the adventurous who migrated, or were they forced out like immigrants today, or what? Or maybe those are unanswerable questions? The liberals ventured out to the new and unknown.The conservatives stayed behind with the known. Not unlike today. I don’t think liberals are a majoity of migrants today. Here in Europe at least, most immigrants are ultra-conservative. During the colonial period, some migrants were liberal but I think the majority were again conservative. I was first using liberal in the sense of being adventuresome and open to new ideas, not in the political sense. As in being conservative in behavior. As opposed to taking risks. I would guess the answers to all these questions are many and may not all be discovered. Just think about the more modern version, how and why did the Europeans come to the new world. One might say they came for religious reasons. Others would say it was economic and the investment company expected a return from those who sailed away. And once they established a location here in the new world what caused them to travel on to other places. Some were shunned and forced to move on – that is how we ended up with Road Island. Others were looking for better land and a better life. I think part of the problem lies with our modern interpretation of the word “migration”, i.e. a group of people deciding to relocate, packing their bags and buying a ticket from Place A to Place B, just as 19th century emigrants from Europe decided to seek a new life in the USA, Canada or wherever. Among ancient hominids it would never have taken place like that. Homo erectus living in East Africa 1.5 million years ago never took a conscious decision to “leave” Africa and move to Asia. They had no concept of any such places as Africa or Asia. Instead, we should just think of the natural process of range expansion of a successful species whose numbers were increasing. Each year, groups at the periphery of the species’ range would just expand their foraging horizon a few miles further into unoccupied territory. As population increased, groups would splinter and fragment, and small numbers would just move across the hill, to the other side of the river, or wherever they could find resources and make a living. The whole process would have been very slow and gradual, but even at a net rate of only a few miles per year hominids could have expanded their range from Ethiopia to China in a space of time so short as to appear instantaneous in the geological record. I think this is a good description. Of course. It’s probably a process similar to the wide distribution of some bird or mammal species we can observe today. They simply expand their population and need more habitat. The humans that moved from Siberia to Alaska were land locked for 10,000 years due to ice flows. When they finally were able to exit the north, they spread the length of North and South America in a very short time. So that gives an idea of how much interbreeding must have occurred across Europe and Asia and Africa over the past 100,000 years. Is this the polygenism mentioned in the encyclical Humani generis? 3897. When there is a question of another conjectural opinion, namely, of polygenism so-called, then the sons of the Church in no way enjoy such freedom. For the faithful in Christ cannot accept this view, which holds that either after Adam there existed men on this earth, who did not receive their origin by natural generation from him, the first parent of all; or that Adam signifies some kind of multitude of first parents; for it is by no means apparent how such an opinion can be reconciled with what the sources of revealed truth and the acts of the magisteriumof the Church teaches about original sin, which proceeds from a sin truly committed by one Adam, and which is transmitted to all by generation, and exists in each one as his own [cf. Rom 5:12-19; Concilium Tridentinum, Sessio V, canones 1-4 ]. If by “complicated” you mean “religious fantasy” then I agree. Note that “Eve” has the exact same problem. And who did their children marry? It’s theological conundrums all then way down, or as the common computer program saying goes GIGO; Garbage In [always results in] Garbage Out. For a very long time, so-called human beings have developed standards of not only what characteristics are required for indivudualsto be categorized as “human” and what morphological qualities are deemed desirable and beautiful. Children’s heads were flattened or elongated. Teeth were blackened or sharpened. Skin was scarred intentionally or tatooed. etc. Rings were worn around necks to lengthen them. Etc. I don’t know to what extent our scientists are able to determine whether physical differential characteristics between groups is due to environment vs. cultural notions of beauty. I think that anthropologists can recognize induced deformations. At least, those I know claim that they can. They undoubtedly are much more knowledgeable about this than I am. There are some weird people, however, who assume that any such oddities they find must be aliens. Also, there are some people with major deformities of one sort or another that may cause them to be viewed by “so-called normal” human beings as not human. I just recently read an article in one of my science magazines about the individual referenced in the following article. Some “scientists” believed her to be an alien but DNA testing proved otherwise. She was a tiny little thing thought to have been stillborn or died shortly after birth and they say her bones were more like those of a 6 year old than a newborn. Thank you for the linked article, very interesting! Also be aware that Nat Geo has been known to publish gibberish as science. “Some “scientists” though her to be an alien”?!! Yeah, my first thought would always to be to start with the most absurd hypothesis that anyone could dream up. “multiregional” as used in the WEIT post shouldn’t be confused with the more traditional use of “multiregional” in anthropology which refers to early homo leaving Africa more than a million years ago and then, with limited interbreeding, independently evolving into sapiens in different parts of Europe and Asia as well as in Africa for the populations that remained there. The paper cited on the post makes de distinction calling it “African multiregionalism”. I would not want to refer to the described scenario as the “multiregional hypothesis”, since that term is already taken by the likely defunct hypothesis that H. sapiens emerged simultaneously in Africa, Europe, and Asia from earlier populations of H. erectus. It is good to see population structure investigated. There has been too much acceptance of the idea that Homo sapiens must have originated in one small region, and if different-looking individuals are found at the same time in different places, that these must be named as different species, only one of which could have contributed to our ancestry. Of course there is a built-in bias toward splitting in paleoanthropologists, as that way they get to discover a new species. There is also the ambiguity as to how long ago were the “first modern humans” and who gets to declare that. We’ll see how this will play out. I’ve read everything by Begun, Pääbo, Stringer etc. I don’t know how important it is to find out in how many places Homo sapiens sapiens first emerged, if it remains true that most of our genetic inheritance comes from the East Africa of 150 000 years ago. It seems Homo erectus might have lived in China more than 2 million years ago. Let me predict we’ll only need two species names for the entire Homo genus: Homo ergaster (or whatever) and Homo sapiens. I’m all for calling it Australopithecus habilis. Have you read David Reich’s “Who we are and How We Got Here”. He also notes there was a mixture of isolated populations in the. 100-50K range. He carries the ‘Braided River” concept up to the present using DNA Data. I might be dumber because of it, but my elongated braincase sure cuts down on wind resistance. My sagittal crest is even more primitive but I’m a runner so it helps with sharp turns. This could give you some advantage if you regularly travel by bike in the Netherlands. An interesting paper that I will read one of these days, also because I am in the middle of reading David Reich’s “Who we are and how we got here” (a very good book in spite of the author’s repeated bragging about his lab’s achievements). I thought Asia was the new Africa? !